INTERNATIONAL CAMPAIGN IN SOLIDARITY WITH THE STRUGGLE OF ALITALIA WORKERS ! NO LAYOFFS ! WE DEFEND THE RIGHT TO STRIKE ! Alitalia’s workers have been struggling for a few months against a plan of reorganization, because of reduced income for the company, it is a plan supported by the government and shareholders, which involves cutting thousands of jobs, salaries and increasing work loads. This plan is supported by the large union confederations Cgil, Cisl and Uil. The union members, part of Cub Trasporti, have organized six strikes and large demonstrations at Fiumicino airport and in the city of Rome, to demand nationalization for the company’s recovery. The strikes have had very great support which caused the cancellation of hundreds of flights. The company and union confederates have tried to use blackmail threats, proposing to Alitalia that they organise a referendum for Alitalia workers in order to approve 1800 layoffs and wage cuts. In the context of the referendum consultation, the government, through the Prime Minister Gentiloni, has intervened publicly in favour of YES (supported by all agencies of press and television) in case the workers voted NO ! The Cub Trasporti union, together with the Air Crew Committee, have given life to the NO Committee with the clear indication of voting NO : the NO was won by 67%, against the desire of the government and Cgil, Cisl and Uil. In spite of the victory of the NO and despite the success of the strikes, Alitalia is implementing its reorganization project and, with the tacit support of the government and the bureaucratic syndicates, has activated an unemployment fund (called “Cassa integration” : this fund is for workers who cannot work and will have reduced wages) for about 1,400 workers, including some trade union activists from Cub Trasporti. In addition, the government, always supported by bureaucratic unions, after the success of the general strike on June 16 (a general strike of all transport and logistic workers, launched by Alitalia workers and supported by many grassroots unions) has announced its intention to limit the right to strike in transport, a right that already has many restrictions in Italy. 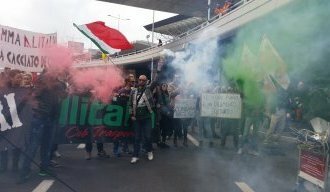 reject Alitalia’s plan of reorganization and sale lowered with thousands of layoffs ! reject attempts by the government and trade union bureaucracies to limit the right to strike ! intend to respect the will of the majority of workers who in the referendum have rejected the restructuring plan, layoffs and wage cuts ! express solidarity with the unionized Cub Trasporti who is organizing the strikes, against the attacks of the government and the company !